Personel: Florian Fricke (piano, cembalo, vocal), Daniel Fichelscher (E-guitar, drums, konga), Conny Veit (E-guitar, 12-string guitar), Klaus Wiese (tamboura), Robert Eliscu (oboe). 4th album, from 1973 ("Songs of Praise"). Following a period when Fricke and Veit became involved with a reformed Gila (recording Bury My Heart At Wounded Knee), they returned as Popol Vuh for this album, adding the additional psychedelicized guitar of Daniel Fichelscher (who would become a key central figure throughout the history of the group) and oboe, konga, tamboura accompaniment. Florian takes over on vocals for once, and within the context of softly flowing/lightly trancing rock this is masterful work. Improves on the meditative style of Hosianna Mantra. Fricke sings the lyrics from 'Song Of Solomon' himself, adding an amateurish touch to the music. Translating as 'Songs Of Praise', Seligpreisung builds on the acoustic styling of Hosianna Mantra. However, this outing adds a bit more psychedelic guitar work to the meditative sound and the lyrics have been taken from Vangelo di S.Matteo. Gone is the soothing voice of Djong Yun, having been replaced here by Florian Frickes drones of praise. 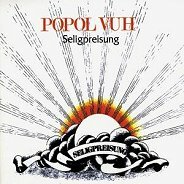 This album was the first Popol Vuh album to feature Daniel Fichelscher and can be seen as the beginning of the Fricke-Fichelscher musical relationship which is responsible for what is arguably Popol Vuh's greatest output. Fricke first met and played with Fichelscher on Gila's 'Bury My Heart at Wounded Knee' album. Musically speaking, this album is dominated by Frickes piano and Fichelscher and Conrad Veit's psychedelic guitar work. The two standout tracks are 'Selig Sind Die Da Hungern' and 'Tanz Der Chassidim'. 'Selig Sind Die Da Hungern' begins with a majestic piano sequence before launching into a great psychedelic guitar solo courtesy of Conrad Veit from Gila. 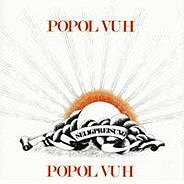 On the other hand, 'Tanz Der Chassidim' is a more subtle guitar and piano jam which sets the foundation for the Popol Vuh meditative sound to come. The first three tracks are the strongest for they have a feeling of completeness. The shorter tracks do not sound as complete because their development is not as pronounced. This is probably due to the fact that these are songs of praise and worship (pun not intended) which are not focused on the music. Clocking in at just over 29-minutes, this is by far the shortest album in my krautrock collection.